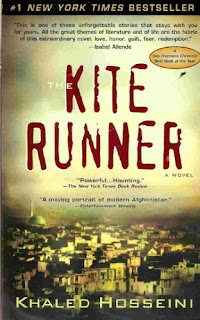 Book 18 of 2015 is Kite Runner by Khaled Hosseini. This is one of those books that I can't see being made in to a Hollywood movie because it doesn't start, travel or end like one but somehow they managed apparently. I truly enjoyed this book although this is one of my least favourite settings and genres. My view is usually that life is raw and depressing enough out there in these tough countries without reading fiction about it. The thing with fiction is that it makes is palatable and relatable and that is endearing. This an insight in to two best friends who lived in the same world but with different rules. Everyone I know has liked this book and I understand why now. It is quite well written and the story keeps you interested the whole way through. 4 kites cut down out of 5. Should I read this? Yes, I think so. It opens up a world that we get little human insight in to. What did I learn? That fighting over what god says is never constructive.